The newly renovated Crescent Hotel in Beverly Hills is a charming edition to a city known for its hospitality to visitors from around the world. The beautifully appointed hotel on Crescent Drive, just a block from the Beverly Hills City Hall, and two blocks from Rodeo Drive, is a perfect destination for those visiting from across the country, the world, or just to enjoy a romantic dinner. The BOE Restaurant offers modern American cuisine for breakfast, lunch and dinner, as well as providing room service to hotel guests. Breakfast with Chef Denise Shmikler is filled with creative innovations on the usual breakfast fare, including tiny French toast and healthy omelets. The luncheon menu has made this a trendy place for a business lunch any day of the week. Dinner with Chef Erik Ritter will amaze your sensibilities with his creative presentations. The appetizers include a French fries served in a rolled down paper bag, with delicious tomato dipping sauce, as well as his own shrimp and tuna dishes; entrees offered combinations with Mexican, Asian and Middle-Eastern inspiration, and they are all culinary delights. The dessert menu included the ultimate de je vous return to your girl scout days with the arrival of a variation on s'mores. Yes, marshmallows on a skewer to be cooked on a little fire and dipped in chocolate. It's fun, familiar and delicious! The cocktails and wine menu at Boe are quite varied and offer something for everyone. The signature cocktail is a beautiful pink martini, and they also serve four tiny martinis on a tray called "the sampler." Each drink is a different color and includes exciting ingredients served with accompanying condiments. Four tiny burgers can also be enjoyed with this unique cocktail assortment. The food here is artistic, but flavorful and the presentations are one-of-a-kind. According to Chef Ritter "we buy the freshest produce, as well as the finest fish and meat products for our menus." "We are constantly trying new items and reinventing old dishes to give them a now appearance and taste." Guests at the hotel find the inside restaurant/bar and patio restaurant a special place after dark, when the candles turn it into a magical little jewel box, where business or romance rock. The 35 luxurious hotel rooms are beautifully appointed in American modern style, have every amenity, including state-of-the-art electronics, and luxurious guest bath products. The Crescent offers a convenient and relaxing venue where vacationing guests or business executives can meet with friends or clients in Beverly Hills. The Boe bar has become a popular cocktail spot for the hip young professional crowd in Beverly Hills, where they can network at hotel special events, or enjoy dinner with a date. For reservation information call 310-247-0505. Renowned wine expert Steven Olson joined a group of wine aficionados at a one-of-a-kind luncheon featuring exceptional Alsace, Cotes du Rhone, and Jerez Sherry wines, which were perfectly paired with an extraordinary menu crafted by acclaimed Chef Josia Citrin, Melisse Restaurant, located at 1104 Wilshire Boulevard in Santa Monica, California. The Citrin menu included Maine Lobster “Veloute” served with Gonzalez Byass Tio Pepe Fina and Emilio Lustau Amontillado Bodega Vieja; Green Garlic Ravioli with Razor and Manilla clams, chorizo with clam broth, paired with Albert Boxier Pinot Blanc 2001 and Domaines Schlumberger Riesling Saering Grand Cru 2001; Eastern Halibut and Santa Barbara Prawn with bok choy, shitake mushrooms, lemongrass ginger nage paired with F.E. Trimbach Gewurztraminer 2002 and Jean-Pierre Dirler Tokay-Pinot Gris Schimberg 2000; Roasted Liberty Duck Breast with red wine cous cous, Brooks cherries, Foie Gras sauce paired with M. Chapoulier Cotes du Phone Belleruche 2003 and Paul Jaboulet Aine Cotes du Rhone Villages 2001; Prime Beef, filet, strip loin and short ribs with potato fondant, ramps, porcini mushrooms, brown butter Béarnaise sauce paired with E. Guigal Cotes du Rhone 2001 and Vignobles Brunier Domaine Les Pailleres Gigondas 2001; Sticky Toffe Pudding with warm date and caramel pudding, red fruit consommé, vanilla ice cream paired with Williams & Humbert Dry Sack Solera Especial 15 years and Sandeman Royal Ambrosante Old Solera Pedro Ximenez. Citrin’s culinary skills are renowned, but he surprised and delighted the guests at this luncheon with his perfect menu choices, that were presented so beautifully, and thoughtfully paired at the Alsace - Cotes du Rhone - Jerez tasting luncheon, a campaign launched with the assistance of the European community. For wine information please visit www.alsacewines.com; www.rhone-wines.com; or www.sherry.org. ; or contact SOPEXA at 212-477-9800. 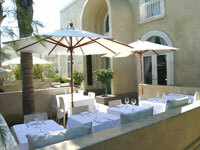 For Melisse Restaurant information please visit www.melisse.com or call 310-395-0881.